Wave... features many outstanding jazz artists such as Oscar Peterson, Toots Thielemans, Pat Metheny, Sarah Vaughan, and Brazilian singer Elis Regina. Songwriter/pianist/guitarist/vocalist Antonio Carlos Jobim attracted attention in his native Brazil in 1956 when he contributed to the score of a play called Orfeo do Carnaval with poet Vinicius de Moraes. When the play was made into the film Black Orpheus in 1959, its soundtrack attracted the attention of American jazz musicians. In 1963 Jobim recorded with fellow Brazilian, singer Joao Gilberto (who had already recorded several of Jobim’s songs), and American jazz saxophonist Stan Getz. The album, Getz/Gilberto with Jobim on piano, won four Grammy’s (including Best Album) and spawned a sequel (Volume 2) the following year. Although Getz had previously recorded an album called Jazz Samba, it was the 1963 release that launched the bossa nova craze. Getz/Gilberto became one of the best selling albums of all time, and in 2003 Rolling Stone magazine ranked it number 454 on its list of the 500 greatest albums of all time. One of its songs, “The Girl from Ipanema” sung by Astrud Gilberto (Joao’s wife), attracted attention internationally. Jobim enjoyed many successes between Getz/Gilberto and the album Wave which was released in 1967. The arrangements on Wave are by Claus Ogermann and several songs feature trombonist Urbie Green. “Wave” and “Triste” were the only two songs from the album to become hits. Jobim wrote the Portuguese and English lyrics for both songs. 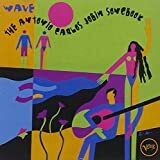 A 1996 collection of Jobim’s work entitled Wave: The Antonio Carlos Jobim Songbook features many outstanding jazz artists such as Oscar Peterson, Toots Thielemans, Pat Metheny, Sarah Vaughan, and Brazilian singer Elis Regina. Jobim’s gentle bossa novas often sang of love, sometimes sadly. However, “Wave” is about falling in love, “catch the wave, don’t be afraid of loving me,” and its repetitive phrase “the fundamental loneliness goes whenever two can dream a dream together” is testimony to the attributes of love. Ella Fitzgerald recorded “Wave” in her 1981 tribute to Jobim, and a recently discovered recording of Mel Torme, Gerry Mulligan, and George Shearing in a 1982 concert features “Wave.” Sarah Vaughan was noted for her rendition, guitarist Mimi Fox included the song in her 2001 CD Standards, and saxophonist Anton Schwartz recorded it for his 2006 release Radiant Blue. As could be expected, several native Brazilian jazz artists have recorded “Wave,” including Sergio Mendez and Brasil 66, guitarist Oscar Castro-Neves, and pianists Manfredo Fest and Eliane Elias. Antonio Carlos Jobim’s tune caught the public’s fancy when it appeared in the early-1960s, but it didn’t take off with jazz players until later in the decade. One of the first jazz recordings was by pianist Oscar Peterson in 1969 with a large ensemble consisting of his rhythm section plus a contingent of German musicians. That same year tenor saxophonist Stanley Turrentine did an especially engaging version for Blue Note. Swing-era drum titan Buddy Rich fronted a successful big band in the 1960s and ‘70s that kept pace with changes in jazz rather than being an essay in nostalgia. Pianist Alan Broadbent’s arrangement of “Wave” is typical of the great material Rich was performing. Dave Brubeck’s long-time alto saxophonist Paul Desmond struck out on his own in the 1970s, leading a group with guitar instead of piano. A live recording from 1975 features talented plectrist Ed Bickert and leader Desmond doing a stellar rendition of Jobim’s tune.